Whenever I cook Indian food I tend to go a little bit overboard. There will inevitably be at least two curries (one meat-based and one bean-based), a couple vegetable dishes, rice, several salads, and a chutney or two. 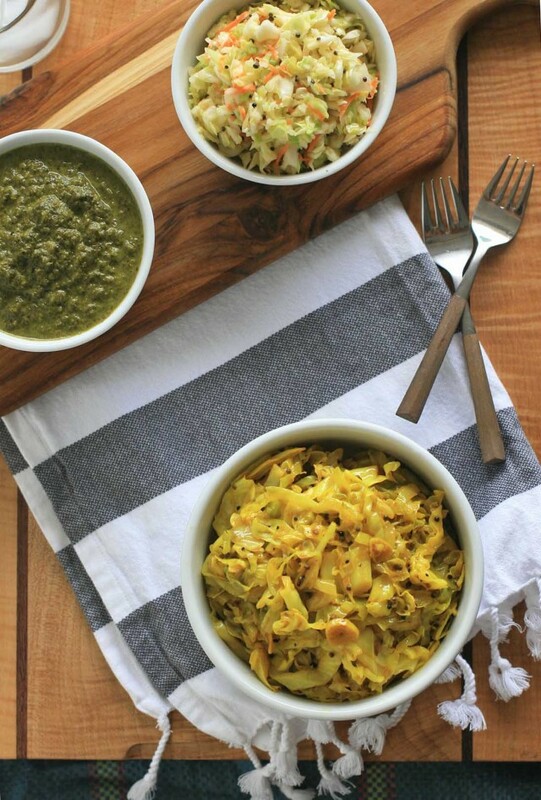 While I’m constantly experimenting and trying out new recipes, I’d consider no Indian spread complete without this spicy cabbage dish. It’s easy to make, inexpensive and people invariably go nuts over it. I’ll confess to quite a few late night fridge raids for the express purpose of sneaking some spicy cabbage. It’s really that good. A mustard seed tadka provides the flavor base, to which garlic, turmeric and cayenne are adding along with a mountain of shredded cabbage. It all cooks down to a vibrantly colored, glossy and flavorful side. If you’re on the fence about trying this, perhaps I should plug the nutritional benefits to push you over the edge? 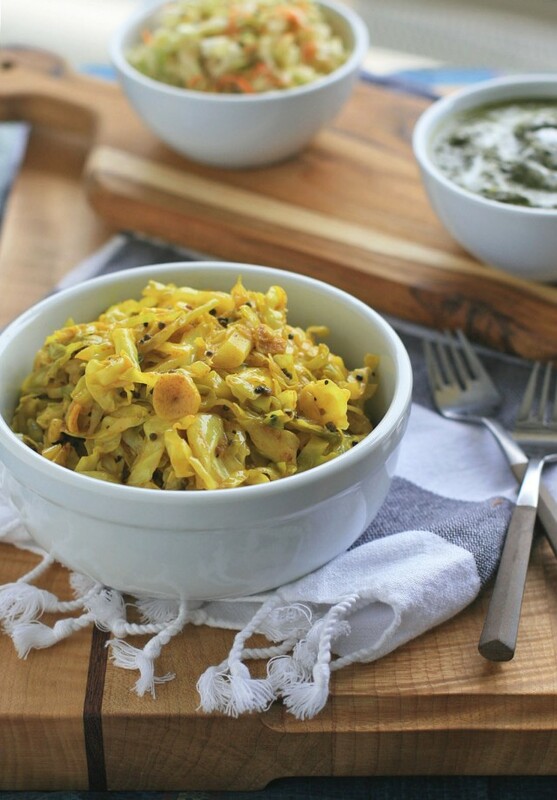 Cabbage is widely regarded as an excellent cancer preventing food and it’s paired with plenty of turmeric, arguably the best anti-inflammatory spice out there. Eating healthy is easy when it tastes this good. This is one of those rare dishes that I like to be somewhat heavy on the oil. You can reduce the oil to 3-4 Tablespoons or so if you like, but you may need to add a bit of water along with the cabbage to get the right consistency. Heat the oil over high heat in a large skillet. When the oil starts to smoke, add the mustard seeds and immediately cover with a lid or a spatter screen. When the seeds begin to stop popping, carefully add in the garlic and turmeric (you may wish to remove the skillet momentarily from the heat to do this to help the oil cool down a bit faster to keep the seeds from burning) and lower the heat to medium heat. Cook, stirring frequently, for a minute or two to soften the garlic. Add the cabbage, salt, and cayenne and give the mixture a good stir to coat the cabbage in the oil and spices. 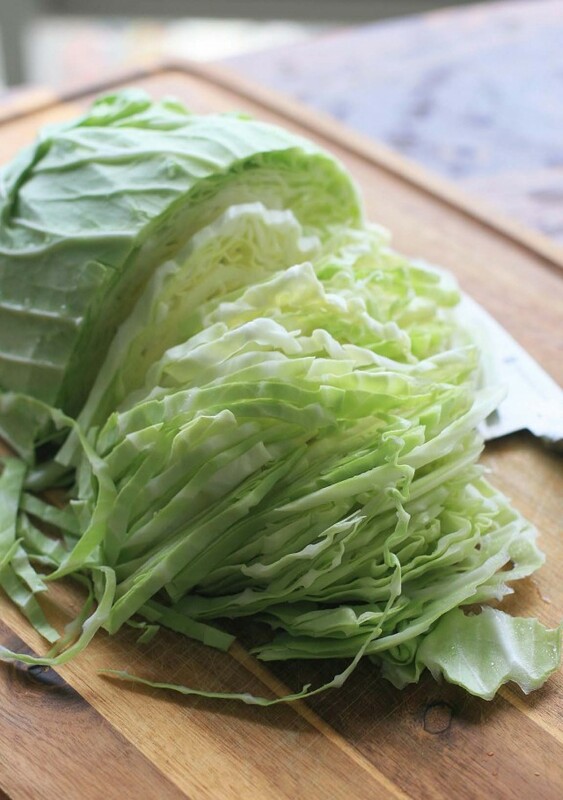 Cover and cook until the cabbage is tender-crisp or completely soft, as desired. Taste and adjust salt if necessary. Serve hot.